Whether you are in need of new home wiring services, full-house wiring replacement services, insurance claims and inspections or new addition build-out wiring services, Handy Electrician has got you covered. Our team of professional electricians in Atlanta also installs new or additional panel boxes for your growing electrical needs. We provide electrical inspections, routine electrical wiring maintenance, and will consult with you on ways to make your home more energy efficient. Ceiling fans can substantially add to the energy efficiency of any room, during any season. So can proper lighting fixtures when situated in different areas throughout your home. And don’t forget about exterior lighting. Handy Electrician can help you to illuminate the exterior of your home, giving it more curb appeal, and by making it safer. Ask us about the many ways we can help you make your home more comfortable in any season, with more energy efficient electrical appliances, and timers. Just bought a new flat-screen T.V? No problem! We at Handy Electrician realize that most rooms are limited for space. Rather than placing the T.V. on an expensive stand, let us mount it on the wall for you. 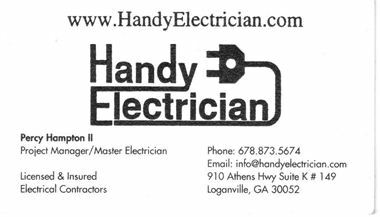 Handy Electrician provides electrical wiring services for Home Theater Systems in the metro Atlanta area. Our electrical wiring specialists will mount your Plasma television and speakers on the wall in a safe and secure manner. Your friends and neighbors will marvel at the expert installation, and no unsightly wiring will be visible to take away from your viewing enjoyment. At Handy Electrician, we understand that the security of your home is very important to you. In addition to providing you with professional residential electrical service, we will take extra measures to make you feel secure. All our technicians have had background checks, are licensed and insured, and are fully capable of satisfying all of your residential electrical needs. You owe it to yourself to have the best electrical services in Atlanta, and you won't be disappointed. Our electrical technicians provide environmentally sustainable installation practices every chance we get. Rest assured that your home and grounds will be respected, and our electrical crews will clean up after construction. Our goal is to make you a satisfied customer.